Finding a metered parking space in Boston is an absolute nightmare. There are layers of street signs that may actually conflict. In addition there are one-way streets, dead-end streets, construction sites, detours, scheduled street-cleaning days, traffic congestion, events that usurp parking rules, neighborhood parking restrictions, accidents, narrow streets, aggressive drivers, and many other obstacles that make the Boston driving experience truly unique. The paramount rule is to take the MBTA whenever possible. There are few areas of the city that contain unoccupied metered parking spaces. The Financial District may have spaces after 4 pm for instance, but some of the streets do not allow metered parking after 4 pm (read the signs!). The North End may have a bunch of parking spaces available, but local residents with a sticker on their car are allowed to park there! The parking regulations vary, but most often the meters must be paid until 8 pm (Saturdays until 6 pm or later). Finally, you cannot feed the meters for more than 2 hours in most places, and can get fined for even paying the meter. Thus, a list of parking garages is provided here. There are many garages in the city. The Haymarket garage is very popular near North Station. The Boston Harbor Garage is located right along the waterfront. The Post Office Square and Langham Hotel garages are very popular in the Financial District. In east Back Bay are the Boston Common and Park Square garages. In west Back Bay are parking garages at Copley Place and Prudential Center, as well as some of the hotels. 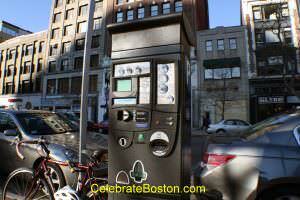 Some areas of Boston have electronic meters in the center of a bank of parking spaces. Vehicle owners must pay via a central meter, and then take the printed slip and place it on the driver's side window facing out. The slip has a timestamp and other information, so make sure it faces out for the meter enforcement person to read. The only parking deals in Boston at some garages are "early-bird specials" (out early after parking overnight or in early on weekdays), and weekend all-day discounted pricing. Parking in Boston is very expensive, and the fines can be even more expensive. There are violations for expiring at a meter, feeding a meter, parking in a local resident spot, handicap spot, fire hydrant, handicap zone or ramp, event or temporarily reserved spot, etc. The Boston Transportation Department (BTD) is very efficient, and you may return to your parking spot on the street and discover your vehicle has been towed. The city impound lot is located in South Bay, and, fair warning, it’s probably one of the largest vehicle storage lots in Boston!